Organized fire protection first became available to residents of the Schaefferstown area in 1831. Prior to that time, protection had been a hastily organized bucket brigade from any source of water near the fire. 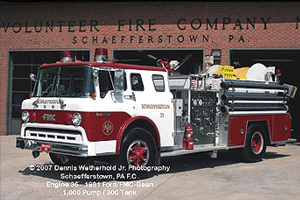 Upon realization that an adequate means of combating fires was needed, the Schaefferstown Fire Engine Company was founded. A constitution and by-laws were adopted and a Cooper’s Patent Rotary Engine, known as “Victor #3,” was purchased for $275. An engine house was erected on the northwest corner of the Lutheran Church lot. Interest in the company dwindled, however, and sometime shortly before the War Between the States, the company disbanded. In 1867, again seeing the need for organized fire protection, fourteen interested citizens submitted a petition for the chartering of the “Victor Fire and Hose Company of Schaefferstown,” to the Lebanon County Courts. A charter of incorporation was granted to the company on January 7, 1868. The “Victor Fire and Hose Company” was short lived, surviving for less than ten years. In 1876, the Reliance Fire Company purchased Schaefferstown’s second piece of fire apparatus, known to the community as “The Little Giant”. The Little Giant Engine is now in the possession of the volunteer fire company. Having secured an apparatus, the company applied for, and received a charter of incorporation on December 6, 1877. The Reliance Fire Engine Company was active from 1877-1900. 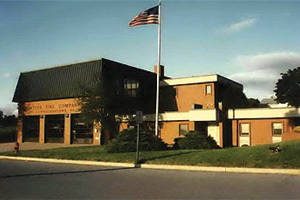 The Schaefferstown Fire Company, as it is know today, was developed by a group of townsmen in a workshop on South Lancaster Avenue in 1909. Charles T. Hickernell was elected the first president and served the company in this capacity until 1948. In 1916 the company purchased a fire hose carriage to be used with the fire hydrants installed in the town about 5 years earlier. 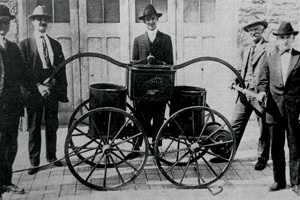 After the devastating loss of the United Brethren Church and neighboring home, that burned to the ground in 1919, the company realized the need for motorized apparatus. 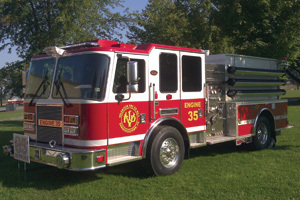 After a heated discussion, the organization decided to purchase a Triple-Combination 500 gallon pumper and chemical engine from the Hahn Motor Company of Hamburg, PA, for $6,000. During the Summer and Fall of 1920 the Evangelical Church was converted into an engine house with the help of Heidleberg Township residents. The Hahn engine was accepted on November 23, 1920. On May 5, 1936, the company agreed to purchase a 10 acre tract that was farmed as a source of income for the next three years. By 1939, permanent buildings were constructed and the land became know as Fireman’s Park. After WWII, when new engines were available again, the company purchased a new 500 gallon per minute pumper from the American LaFrance Company of Elmira, NY. In 1957, due to a lack of water supply for firefighting in Heidleberg Township, a 1,250 gallon Reo Truck was purchased to carry water. Followed by the purchase of a high pressure fog apparatus from The John Bean Company of Lansing, Michigan in 1961. In 1971, the need for a brush truck was identified leading to the purchase of 1954 Dodge Power Wagon for $1 from the Metropolitan Edison Company. With the addition of the brush truck, and the ever growing number of people attending the firemen’s carnivals, it was decided that a new fire hall should be built at Firemen’s Park. This new building, our current hall, was dedicated on June 10, 1973. Over the past four decades, our volunteer fire company has continuously improved its facilities and apparatus, to meet the needs of Heidleberg Township and its surrounding communities. It is only with the support of our community, and the dedication of the volunteers, that we can look forward to our next one-hundred years. Fire Police Captain: Mike Stuber, Sr.